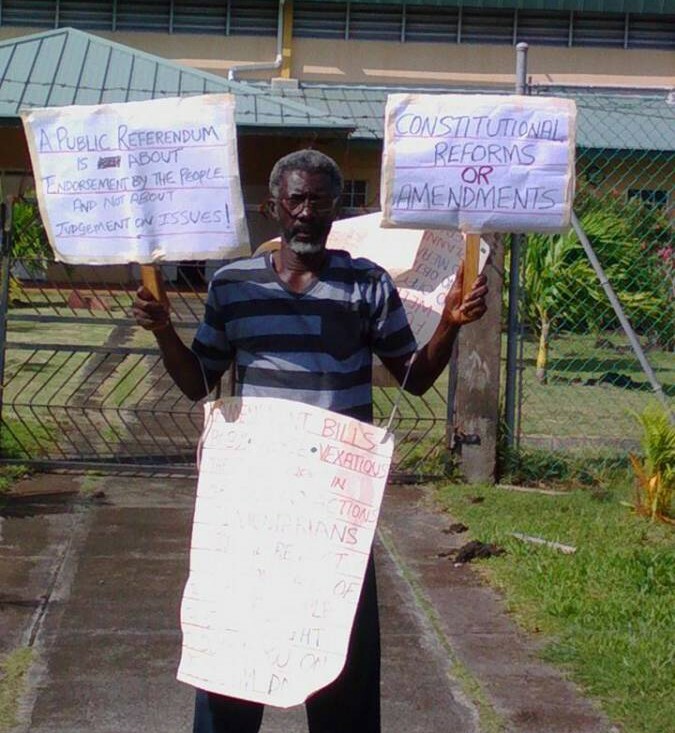 Carrying placards calling for a halt to the presenting of the Constitution Reform Bills and instead reopening the consultation process, Joseph Roberts, on Friday morning was the lone protester at the Grenada Trade Centre, as the Leader of Government Business presented the Bills to the House of Representatives. “There is need for more people to be involved in the process. There is need for more consultations,” Roberts told the media. “The Bills are too costly and heavy on the people,” said one of the placards. The 6 Bills which were presented by Leader of Government Business, Gregory Bowen for first reading, will remain in the House for no less than 90 days before the second and final readings. Once they receive approval from the Lower House, they will move to the Upper House for approval. This will be followed by a referendum for eligible voters. In the referendum, two-thirds of votes must be in favour of having the constitution changed, for changes to take effect. Chairman of the Constitution Reform Advisory Committee, Dr Francis Alexis, said that the action in Parliament is a significant day in the Parliament. “After so many decades, we thank God that at long last we have lived to see read in the House of Representatives today, 6 bills for the reform of our Constitution. Different persons might have different choices, but all of these bills are of vital importance. One of them in particular, takes us way back to the days when the British first came to Grenada a century ago,” said Alexis. Speaking after the adjournment of the House, he said that Committee will now be spearheading public education for the general population and eligible voters, so that they can make a decision for constitution reform or not. Prime Minister Dr Keith Mitchell said that the changes to the Constitution is protecting future generations. He gave the assurance that while the Bills are awaiting the second reading, there will be consultations, and if during that process there is need to adjust any section in the Bills, that will be done. “Get involved — it’s about the country, our children and grandchildren, and the future of this Nation,” he said. 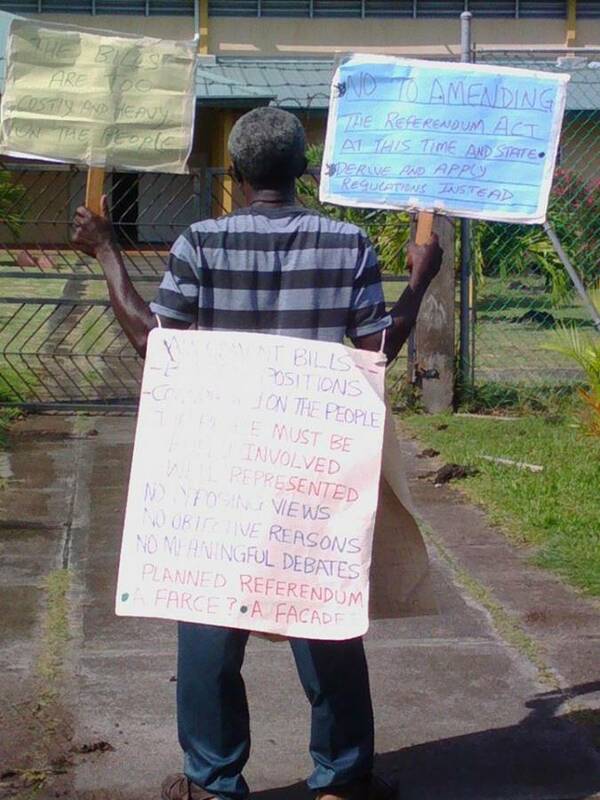 Alexis said the amendments to the Constitution contain a number of new areas, and he encourages people to read, study and understand, in particular the Rights and Freedoms Amendment Bill. The first is to refine the provisions of the Chapter of the Constitution protecting fundamental rights and freedoms. “Another is to insert in the Constitution, a new Chapter 1A on Directive Principles of State Policy; and the other is to insert in the Constitution, gender equality, which through that provision will mandate that a high percentage of women run for political office,” he explained. The Bill also seeks to increase the kinds of conduct which would constitute discrimination prohibited by the Constitution. New grounds would be related to disability, ethnicity, language, religion and social class, in line with the CARICOM Charter of Civil Society 1997. It would be spelled out that freedom of expression includes “freedom of the press” and other media, in accordance with the CARICOM Charter article VIII.